Welcome to the greatest Quinceanera that your daughter has ever dreamed! Well, you’re almost there, you just need some good planning to get to the stage and the Quinceanera Event Planner is the perfect way to do it. 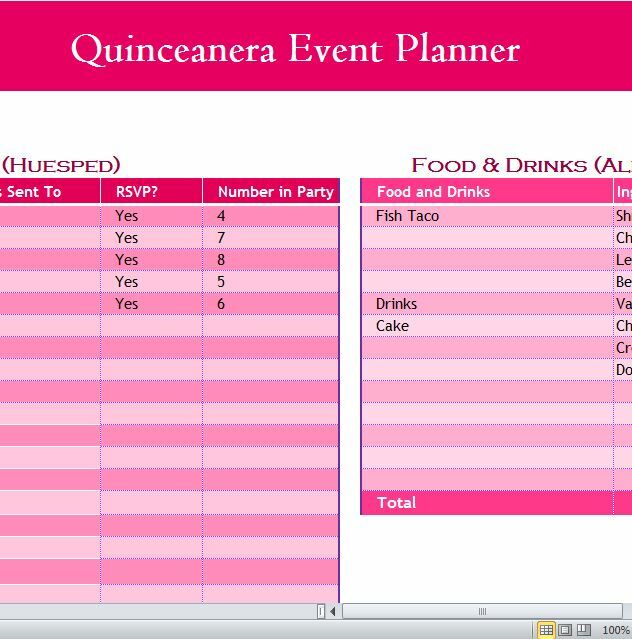 This free template allows you to schedule and track essential parts of a Quinceanera. From there, you can edit and customize the document to make it perfect for your daughter. If you’re ready to ease some of the burdens of planning and have the tools to make this a celebration friends and family will remember, then download this free template today. Downloading the free template is as simple as following the link provided for you at the bottom of this page. Now, go to the “Quinceanera Event Planner” tab and have a look at some of the items already listed for you. This free template sheet has a section to place guest information and your expenses, making it simple to create a budget for your daughter’s Quinceanera. Start with the guest information in the pink table to the right. There are four different columns. For each person, simply start a new row and enter the name, address, RSVP option, and the number of people in their party. The different expenses are displayed in the pink tables to the right. Start by making sure that these expenses are what you want to use for the celebration. If you need to change something just click a cell and write something new instead. Each table that you enter information in will also calculate a running total if amounts are involved. Now, go to the “Summary” tab to see an overview of all this information displayed conveniently for your personal use. You can adjust the amount you spend on some aspects of the Quinceanera and put that money into more important things.